Whisk the flour, baking powder, set aside. Cream the sugar and butter. Add the egg, butter flavoring, and vanilla; mix until well-blended. Roll on a floured surface to about 1/4″ and cut into shapes. 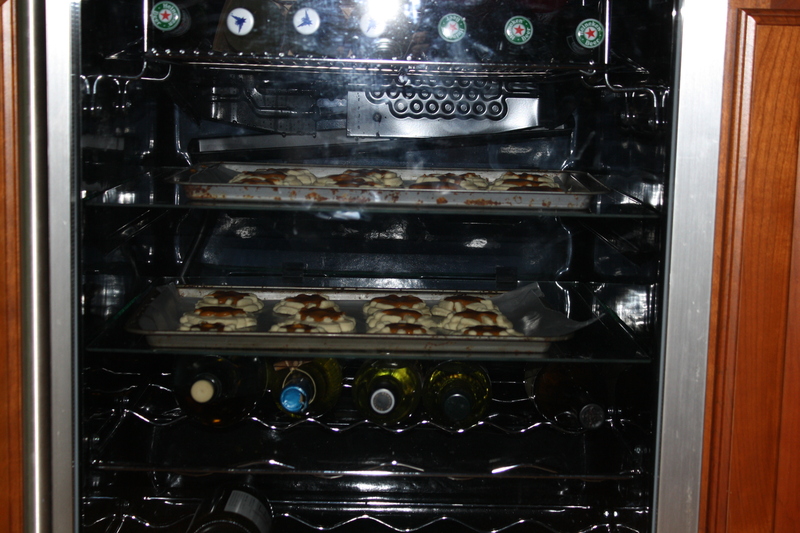 Place on parchment lined baking sheets and bake for 9-12 minutes, depending on the size of your cutter. Let sit a few minutes on the sheet, then transfer to a cooling rack. Place all of the ingredients in a glass or metal bowl and heat over a pot of simmering water (or a double boiler). Stir occasionally, until melted and smooth. The first time I made these, I wasn’t too wild about the cookies themselves, because the cookies were a little grainy. They kind of had the consistency of a pecan sandie, which isn’t bad, but I prefer the butter cookie personally. 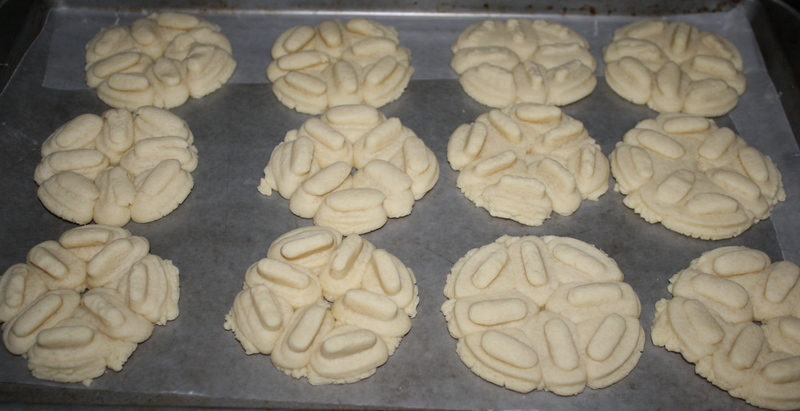 And besides, spritz cookies are a lot easier than roll-and-cut ones. 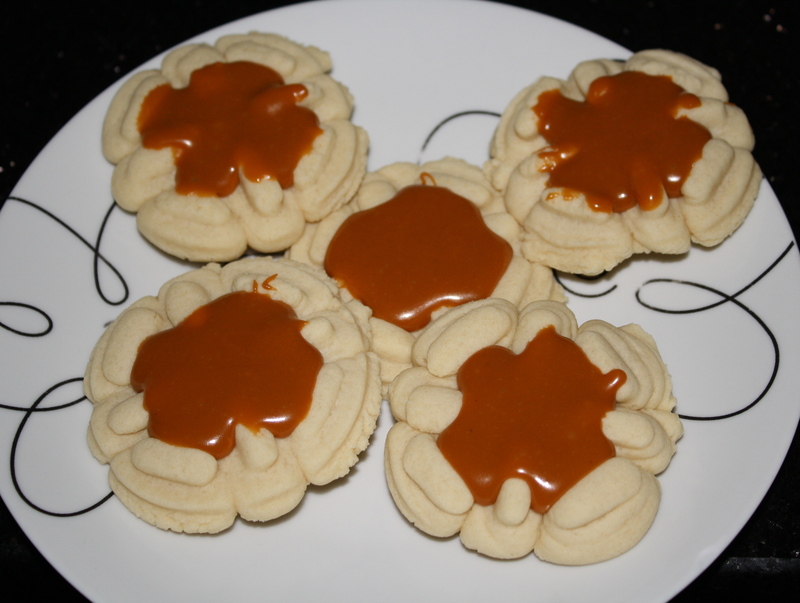 Despite not liking the cookies, the butterscotch glaze was enchanting, so I have since paired that with these standard butter spritz cookies that are on the Wilton site. I stick to that recipe, though if I want to make them extra buttery, instead of the almond extract, I put in a teaspoon of butter flavoring. 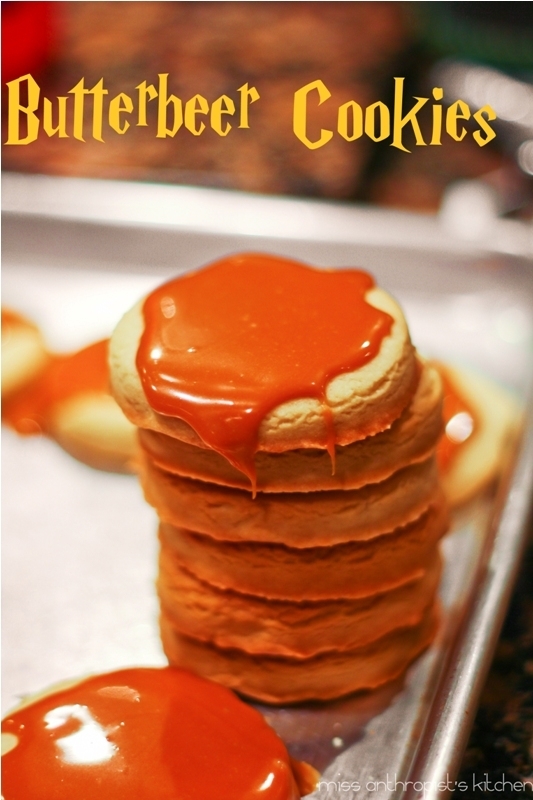 Because of all that backstory, this blog post is going to focus on the glaze rather than the whole cookie. 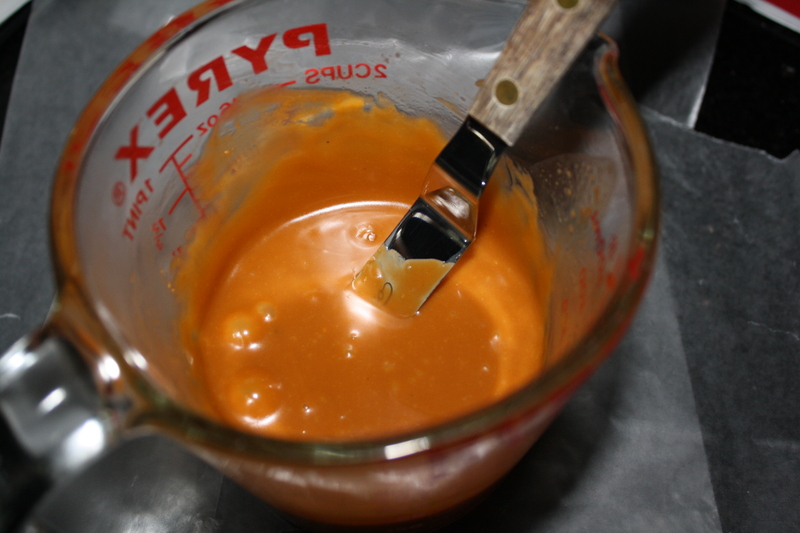 The original recipe tells you to melt the ingredients slowly in a double boiler, which I did the first time. It was fine, but more mess than I like to deal with in the end. Since I don’t have a magic wand with which to deal with that, I have sought alternative methods for melting. The last couple of times I have made these, I have done them in the microwave. After putting all of the ingredients into a microwave-safe cup, I heated them for 45 seconds on medium power, stirred, and repeated the process. Then I removed the cup from the microwave and stirred for about 30 seconds until the mixture was smooth. 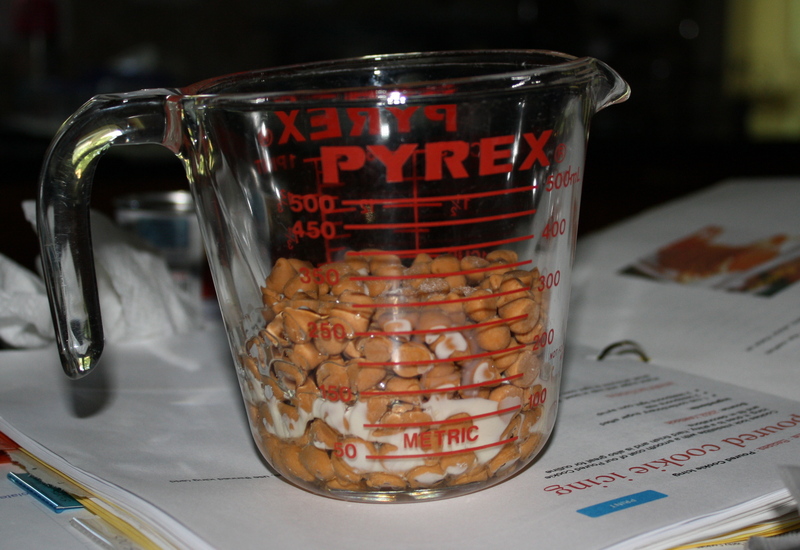 To be honest, this method worked better than the double boiler when it came to removing all the lumps from the butterscotch chips. You can see a few air bubbles there, but the icing is otherwise smooth and ready to be applied. Why? What do you use your wine fridge for? I like how the spritz design holds all of the glaze in. Looks a lot neater than the original pic! Thanks! 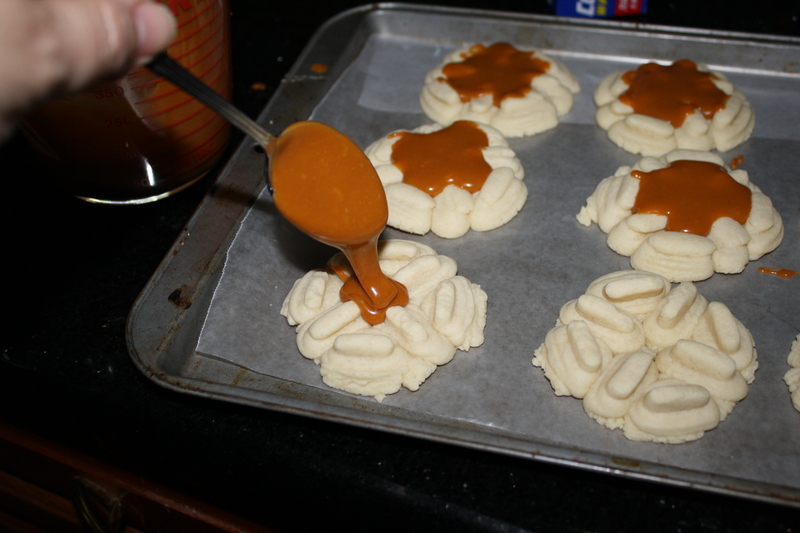 I also like the way the design keeps the glaze confined to the top of the cookie.